On 4 June, 2019 a large-scale exhibition of Natalia Goncharova’s works opens in the Tate Modern in London. 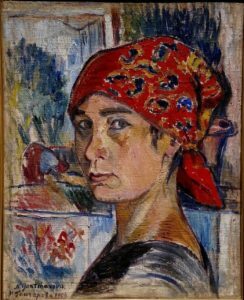 “The richest painter in colors, the pioneer of new painting,” was her first biographer Marina Tsvetaeva’s writing about Goncharova. “The noisy boyfriend of futurism,” art critic Abram Efros called her. Art historian N. Budanova will tell about the bright fate and work of this outstanding artist. Dr Natalia Budanova, MA (Cambs), MA (Courtauld), PhD (Courtauld) is a UK-based independent art historian and a member of CCRAC advisory board. Her research and publications engage in investigating role of women in Russian Art of late Imperial and early Soviet periods, patterns of artistic exchange between Russia and West, and art of the Great War.